-50°F Marine & RV Water System Glycol/Alcohol Antifreeze, gal. Non-toxic antifreeze for potable water systems, ballast tanks and sanitation systems. Winterizing your boat’s potable water and sanitation system for the off season is an excellent way to protect your investment and avoid costly repairs in the spring. 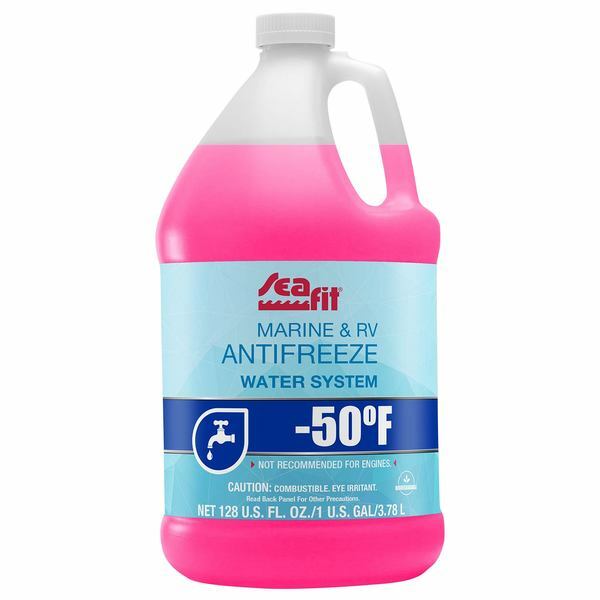 Seafit -50° (-46°C) Marine and RV Antifreeze provides excellent cold weather protection for drinking water systems, ballast tanks and sanitation systems. Ideal for regions with a mild but freezing winter, this non-toxic formula uses pure virgin propylene glycol for quality and effectiveness. As an added benefit of using non-recycled propylene glycol residual smell and tastes are reduced. The bright triple die pink color lets users know when antifreeze has traveled through water lines and sanitation system lines; the die also serves as an indicator when flushing systems in the spring. Seafit Glycol/Alcohol antifreeze is not for use in engines. Alcohol blended antifreeze will evaporate and can leave areas of pooled water less protected later in the storage season. For an antifreeze dedicated for use in water systems, ballast tanks and sanitation systems, look to Seafit Marine and RV Water System blended antifreeze for a safe, effective and ready to use solution. Provides freeze protection within a range of +6°F (-14°C) to +10°F (-12°C); for colder regions we recommend using non-toxic Pure Oceans antifreeze with a -60°F or -100°F rating—see our Antifreeze 101 for a complete guide to selecting the right antifreeze for your climate and application.